The next day after a long night out can be a s rough one. We’re sure that the only thing you want is to taste the “Hair Of The Dog” and eat great food. May we also be so bold as to think you might want to relax and watch some College Bowl games? We’ll you’re in luck! We’re offering all of that. 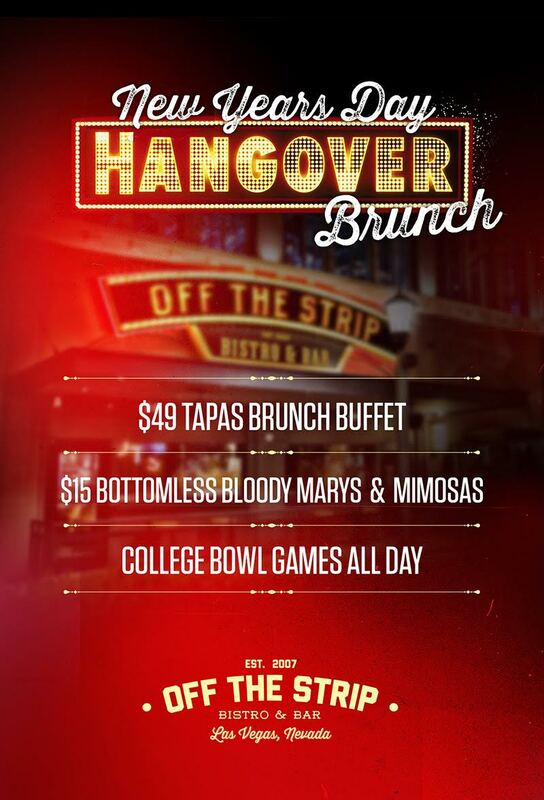 Off The Strip’s Hangover Brunch was made for you! $49, All-You-Can-Eat Tapas Buffet, $15 bottomless Bloody Mary’s & Mimosas, as well as games playing on every TV. We’re your destination after a night out. Just stop in, no reservations necessary unless you are part of a large group. Large group reservations are encouraged to call ahead or fill out our reservation request form.